I’ve loved wearing nail polish for as long as I can remember. There’s just something so invigorating about all of those bright colors, and I love how put-together and sophisticated I feel with a couple of coats of polish on my nails. Anyway, one thing that has been really bothering me lately is how quickly my nails chip now that I spend 75% of my day either cooking, cleaning, or sanitizing my hands, and I’ve been starting to feel like it’s not worth the effort. But then I caught a glimpse of that beautiful wall of nail polishes at our local drug store over the weekend and I realized it IS worth the effort. Every women deserves to pamper themselves once in a while, right? So I spoke to the gal at my local nail salon, did some research online, and put together this list of 7 helpful tips to prevent nail polish from chipping, which have made SUCH a difference in my life. Remember that any bumps, ridges, or imperfections on your nails can cause your nail polish to chip, so take the time to remove any old nail polish, and make sure you shape, file, and buffer your nails so you’re starting with a smooth base. Have you ever wondered why the lady that does your nails at your local salon always asks you to wash your hands REALLY WELL before she applies that deep plum polish you can’t wait to try? I have. And when I asked the gal that did my nails last weekend what the reason is, she explained that any excess oil can prevent polish from adhering to your nails, which can lead to chipping. I always assumed an extra layer of nail polish would do nothing but increase the amount of time it takes my nails to dry, but it turns out applying a base coat is one of the most important steps in getting fabulous, chip-proof nails. Not only does it prevent polish from staining your nails, but it also adheres to your nails better than regular polish, which helps extend the length of your manicure. I’ve tried a few different base coats with success, but I prefer Complete Salon Manicure Smooth and Strong Base Coat by Sally Hansen. Ideally, you should let your nails dry for at least 2 minutes in between each coat of polish, and if you’re wearing a darker shade, you should wait at least 3 minutes as darker polishes typically take longer to dry. For me, finding a good chip-resistant top coat has been a game-changer in extending the life of my at-home manicures, especially when I’m wearing dark nail polish. I’ve tried quite a few different brands, but I’ve had the most luck with the Complete Salon Manicure Ultra Wear Top Coat by Sally Hansen. I learned this trick to help nails dry faster when I was researching for my 10 Beauty Secrets Every Woman Should Know post, and I was amazed at how well it works. But that’s not the only trick out there. Be sure to check out these 5 simple ways to dry nail polish faster over on Prevention for more ideas! If you REALLY want to extend the life of a polish change, you can apply a top coat every single day. I like the Diamond Flash Fast Dry Top Coat by Sally Hansen because it makes my nails look like they’ve been freshly painted AND it dries in 60 seconds! 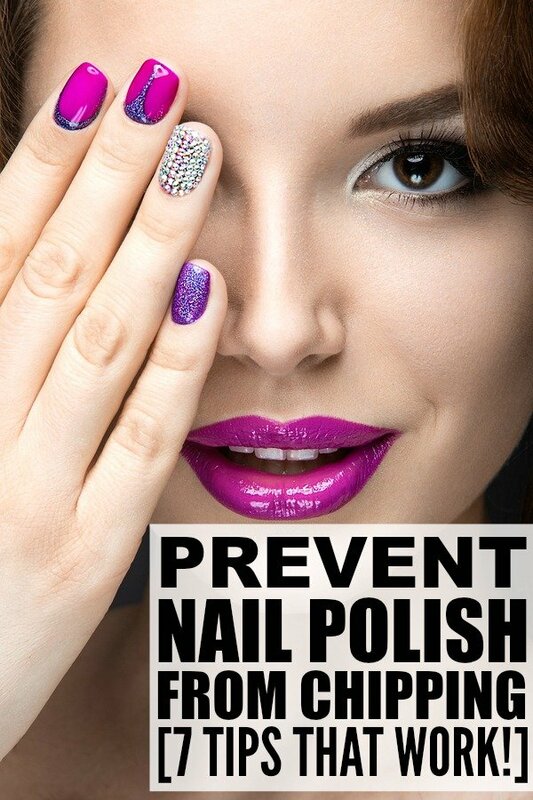 If you found these tips to prevent nail polish from chipping, please share them on Pinterest!